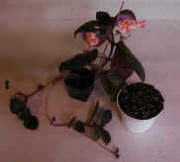 Repotting Episcias is simple, but is a bit different from repotting African violets. 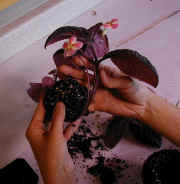 First, Episcias are very vigorous, fast growers, which means that they need to be repotted more frequently than violets. Without good light and timely repotting, they can look a bit “weedy” when left unattended. Also, Episcias readily produce many “stolons” (those small plants on the end of runners). These stolons can give the plant a full appearance or, when grown as a hanging basket, a graceful, cascading, look. Left uncontrolled, however, they can easily grow out of control–a hint: you’ll get more bloom by limiting the number of stolons the plant produces. Here’s how we repot our Episcias, in eight easy steps! 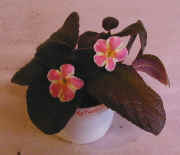 Here’s an Episcia ‘Star of Bethlehem’, in a 2 1/2″ pot (the size that we ship). This particular plant has been neglected for awhile and has gotten a bit tall and “weedy”, so much so that we’ve had to use a stake to hold the plant upright. Notice also the very long stolons–it even has stolons growing from stolons! It is blooming, and it is healthy, but it can certainly be made to look better. We’ll pot this plant into a 4″ azalea pot, and lower the plant so it doesn’t look so tall and spindly, and more attractively arrange the stolons. Step 1: Fill pot with soil and make hole in center. We suggest a light, soilless mix that has been slightly premoistened so it’s easier to use. Fill the pot so that the soil fills firm, but not packed–remember that you need to leave room for the smaller plant. 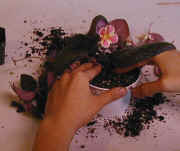 Using a couple of fingers, make a deep hole in the center of the pot large enough to accommodate the 2 1/2″ root ball of the plant you’ll be repotting. The hole will hold its shape better if the soil has been premoistened and is slightly moist. Step 2: Remove lower leaves from plant. This will be hard to do, but it’s necessary. We want a compact, attractive, plant. To achieve this, we’ll have to lower the plant in its pot and bury most of its unattractive stem. This means that all of those lower leaves are now unnecessary, since they would only be buried anyways. You’ll notice that we’ve removed a number of leaves from this plant–the nodes are still visible along its stem. You can see how far apart the nodes are. This plant had been grown crowded in a tray with many other plants, and had gotten insufficient light and room to grow well. Episcias, especially, need good light and room to “spread out” to grow well and look attractive. If not, they’ll tend to grow tall and spindly, like this one. After it’s repotted and given more space, it will grow much better. Notice, also, that we’ve kept the stolons on the plant (we’ll use these later), and have kept only the healthiest, top two rows of leaves. We’ve kept the flowers too, but don’t feel obligated to do so. Sometimes its necessary to remove blooms with the foliage. Step 3: “Rolling-up” the plant. How to get rid of that long stem? 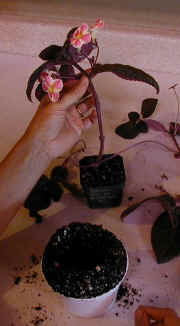 It’s too long to hide by simply lowering the plant in the pot (it’s more than 4″ long!). Here’s a “secret”…. Taking the root ball in one hand, grasp the stem of the plant with the other and carefully wind it around the root ball–just like rolling-up a ball of yarn. If the stolons are long enough, roll them up along with the plant stem. Because they are such fast growers, Episcias usually have fairly soft, flexible stems. If yours is brittle and stiff, let the plant dry a bit (don’t do when very wet), to make it more pliable. Step 4: The “rolled-up” plant. Continue rolling-up the plant until the root ball is just at the level of the lowest remaining leaves. If you accidentally, partly “crack” the stem, don’t worry, it will usually heal. To center the plant (it’s now off to one side of the root ball), you can make a “slot” in the side (nearest the stem) of the root ball and press the stem and plant towards the center. 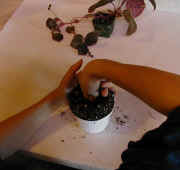 Step 5: Potting the plant. Gently, but firmly, push the root ball (with stem, and stolons, wound around it), into the hole that you made in your 4″ pot. It’s a good habit to handle the plant by its rootball and/or stem, not by its leaves. This minimizes bruising of the plant and keeps soil off of the leaves. 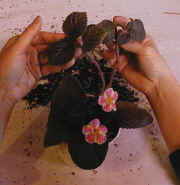 Work your fingers underneath the leaves, firming the soil around the plant. Step 6: Arranging the stolons. We’ve rolled-up the stolons along with the stem, but these were so long that even that they remain long even after the plant has been repotted! No problem. We’ll just use them to fill in empty spaces around the plant, giving it a “fuller” look. To do this, take each stolon and wind it around the stem of the plant, underneath its leaves, until they’ve been shortened enough. Then, press them down into the surface of the soil in a spot that looks bare or in need of foliage. Sometimes, we’ll use “U” pins to keep them in place. These stolons will soon produce roots. Step 7: The “finished” product. Here’s our formerly weedy Episcia, now in a 4″ pot and looking much better! My episcias leaves tend to be rotten when in contact with edge of pot. Please share the care and soil mixture. Thank you. Pots edges shouldn’t be an issue with plastic or glazed pots. If otherwise rotting, than perhaps an issue of overwatering and/or too heavy a soil. Use a soil mix containing plenty of coarse ingredients like perlite and vermiculite. My episcias is large and pretty until many offshoots are hanging. Then the plant starts dying where it is bent over the pot rim. How can I grow a large pot of this when it starts dying when it gets large. Is there a certain type of pot I should use? What can I do? There isn’t any particular type of pot, and should be no reason for it to die at a certain size or age. Assuming if environment and care is no different when it is large versus when small, that the pot size may the issue, since this is only difference. Be sure that plant is not overpotted–use pot size only size of root system or slightly larger. Also, since episcias tend to grow “wide” rather than deep, a shallower pot may be best. Also keep in mind that plants do need to be groomed. It’s OK to remove some older growth and stolons. If anything, this will encourage the plant to bloom more–if you have too many stolons, it has less incentive to bloom. Hello I just want to ask if my tiny little piece of flame violet that has wilted will take root again? I over watered the big plant and saved this small piece I did root it and planted it but noticed this morning that the stem looks rotted so I cut it off and put the green part in water to try to reroot it. I’m so upset as my plant was huge and gorgeous and not sure why I over watered it. So mad at myself for doing it. Please let me know if possible if you know if this very tiny piece will root it has 4 tiny green leaves left on it.